Make a cluttered bedroom a thing of the past with these brilliant wardrobes. We assemble them everyday, so we think we have the authority to say which is the best in terms of construction quality and space saving potential. Pound for pound we think these wardrobes are the best in their class. Need a quick temporary wardrobe storage solution? Try this BREIM from IKEA. This fantastic low cost wardrobe even comes with adjustable shelves and is available in three different colours. 2. High end German flatpack quality. Lets go straight to the other end of the scale with hülsta wardrobe solutions. This German brand still comes flatpacked, but the quality of the design and attention to detail is a testament to German engineering. Joints are virtually air tight and every component part satisfyingly joins together to form solid and stylish statement furniture. Look to pay around £5k and upwards for bespoke wardrobes. 3. Best designer wardrobe bargain. 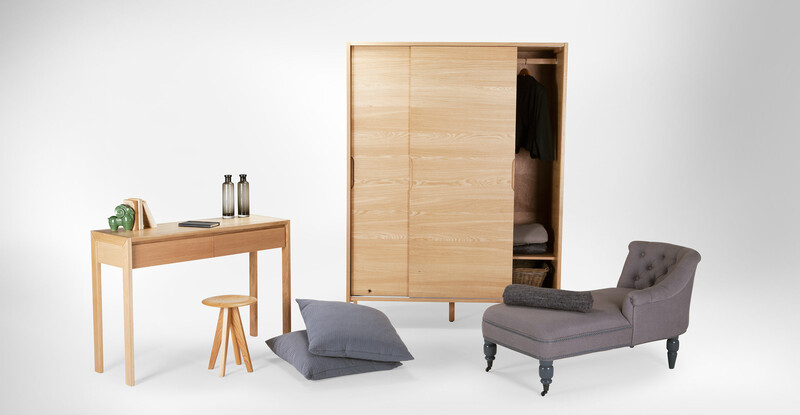 The Ledger wardrobe from MADE is made from solid oak and thick oak veneer, this beautiful ‘organic’ feeling wardrobe has hints of classic Danish design, and feels great when stood on period wooden floors. 4. Best out of the box sliding wardrobe. Want a quick, solid, great looking sliding door wardrobe? Meet TRYSIL. We were blown away by the value this wardrobe provides. Made from thick MDF and great components this product is unbeatable for its price and puts others to shame. The frame feels solid, the doors run smooth, and has lots of space. Looks great too! 5. King of the wardrobes. Style, customisation, and great price – to good to be true? Not with the PAX system. We have saved the best until last. IKEA have absolutely nailed it with their PAX wardrobe range. This range comes in many shapes and sizes, and has tons of different door finishes, ranging from high gloss colours, to mirrored. There are also a vast amount of internal fixings to suit different budgets. You can choose to have basic wire basket drawers or elegant wooden drawer units from the KOMPLEMENT range. We are just as likely to find these wardrobes in plush Knightsbridge apartments, as modest London terraces. This shows the versatility and universal appeal of this product. Add to all that, IKEA also has a fantastic planning tool to help you build your perfect wardrobe. Price: Prices start at £89.